This fiber optic terminal box has a latching top for easy access and accepts up four SC simplex or four LC duplex panel mount couplers. It is used to interconnect fiber splices and terminated fiber cables. The unit comes with four splice sleeves, one cable grommet, four pairs of screws to secure the couplers in place, cable ties, cable management and mounting hardware. This fiber optic terminal box has a latching top for easy access and accepts up to 16 SC simplex or 16 LC duplex panel mount couplers. It is used to interconnect fiber splices and terminated fiber cables. The unit comes with four splice sleeves, one cable grommet, four pairs of screws to secure the couplers in place, cable ties, cable management and mounting hardware. This plastic indoor/outdoorfiber optic terminal box has a latching top for easy access and accepts up 16 SCsimplex or 16 LC duplex panel mount couplers. It is used to interconnect fibersplices and terminated fiber cables. The unit comes with 32 splice sleeves, cleartubing, cable ties and mounting hardware. This wall mount fiber optic enclosure is meant for indoor use and can accommodate up to 24 fiber couplers (24 SC or ST simplex couplers or 24 LC duplex couplers). It is used to interconnect fiber splices and terminated fiber cables. The unit comes with eight 12-fiber splice trays, four cable routing clamps, 48 splice sleeves, eight 6-port blank adapter panels and mounting hardware. This wall mount fiber optic enclosure is meant for indoor use and can accommodate up to 48 fiber couplers (48 SC or ST simplex couplers or 48 LC duplex couplers). 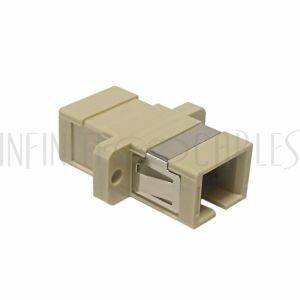 It is used to interconnect fiber splices and terminated fiber cables. The unit comes with eight 12-fiber splice trays, four cable routing clamps, 96 splice sleeves, eight 6-port blank adapter panels and mounting hardware. This wall mount fiber optic enclosure is meant for indoor use and can accommodate up to 96 fiber couplers (96 SC or ST simplex couplers or 96 LC duplex couplers) *Note, there are only enough splice trays splice sleeves to accommodate 96 fibers. It is used to interconnect fiber splices and terminated fiber cables. The unit comes with eight 12-fiber splice trays, four cable routing clamps, 96 splice sleeves, eight 6-port blank adapter panels and mounting hardware. 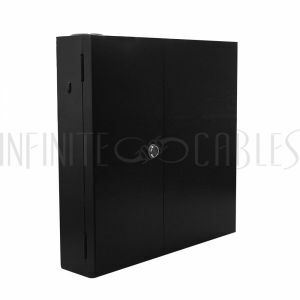 This wall mount fiber optic enclosure is meant for outdooruse and can accommodate up to 48 fiber connections. It is used to interconnectfiber splices and terminated fiber cables. The unit comes with four 12-fibersplice trays, four cable routing clamps, two cable clamps, 48 splice sleeves,four 6 port blank adapter panels, cable ties and mounting hardware.